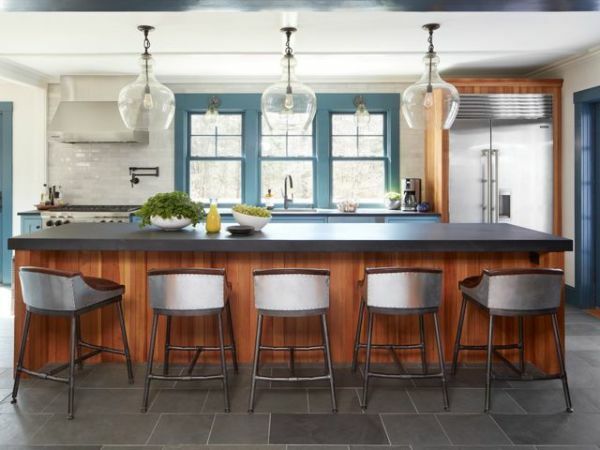 While modern design can be seen as cost-prohibitive to many, its basic characteristics — open planning, simple surfaces and details, and generous glazing — can nevertheless be accomplished with lower budgets. 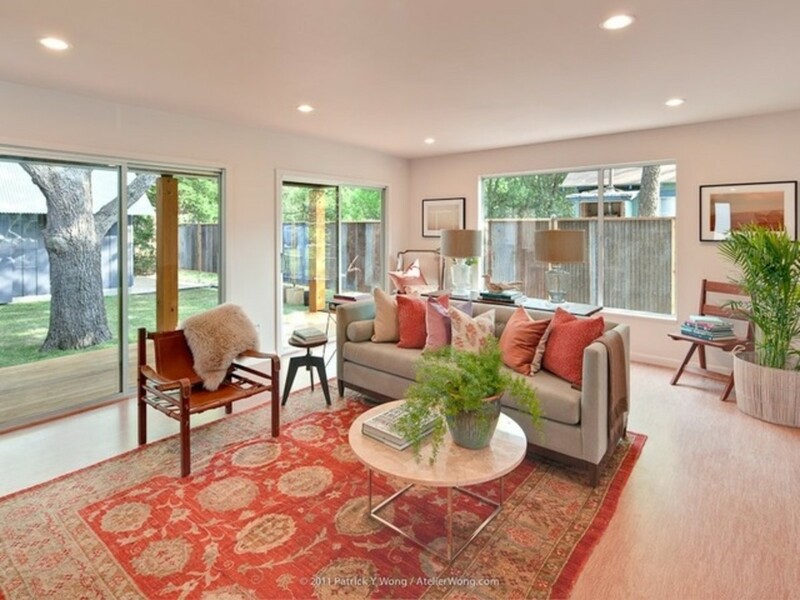 Trimming costs may come with the choice of materials used, the types of details executed, and the size and scale of a house. 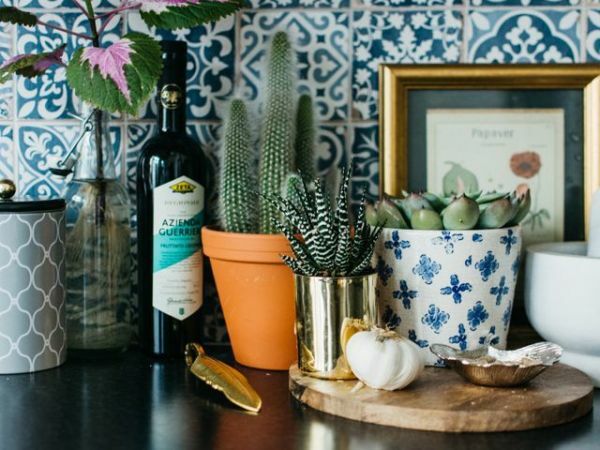 The following examples incorporate one or more of these techniques to exhibit lower-cost and low-tech solutions that are still otherwise modern in terms of space and style. 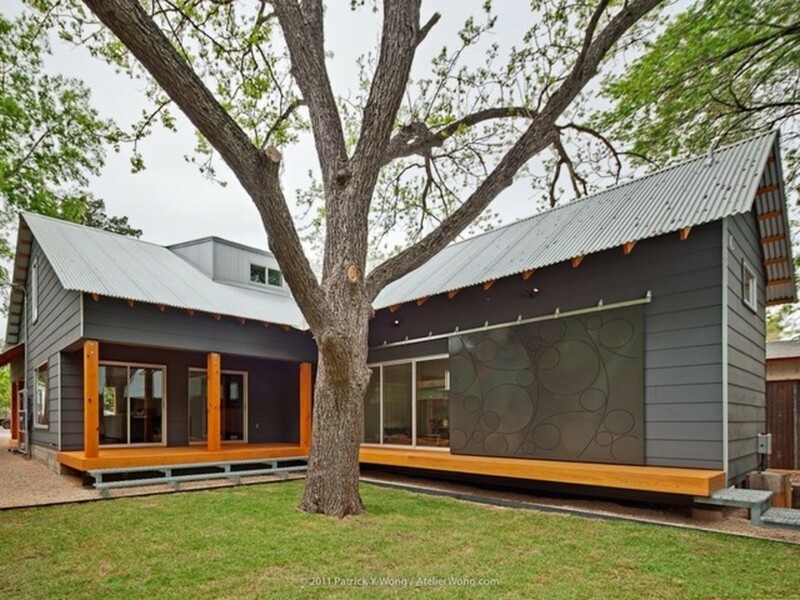 The first example is an Austin house by architect Nick Deaver. 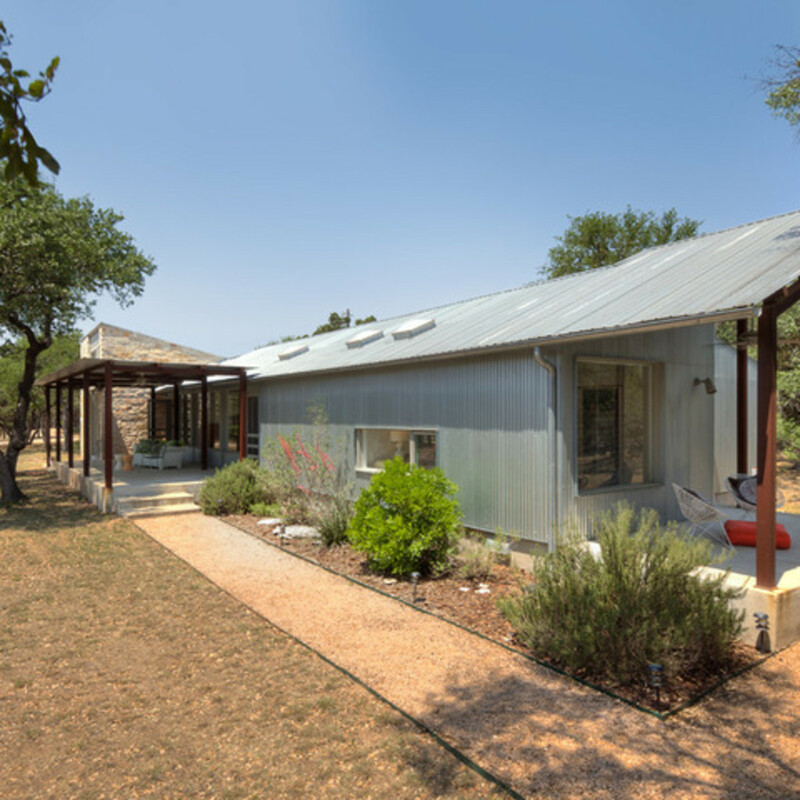 It is wrapped in corrugated metal, a relatively cheap material that is also fairly low-maintenance. 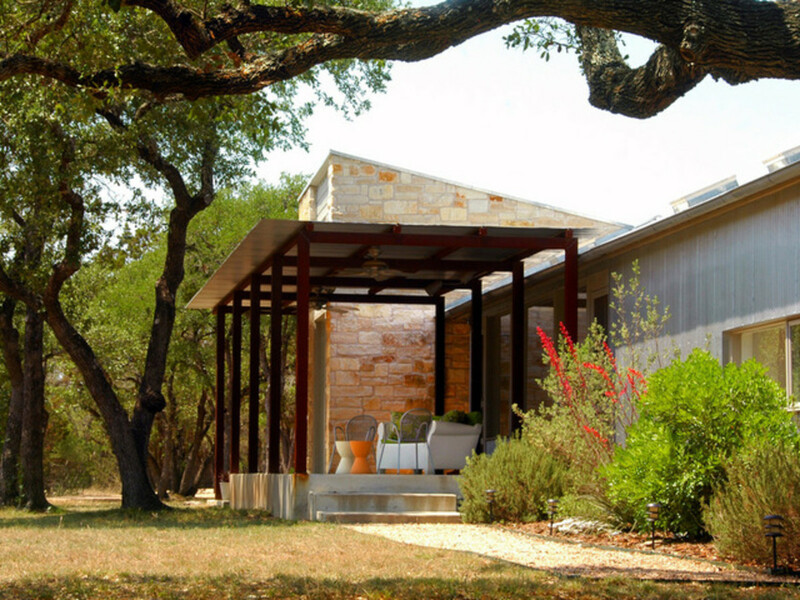 At the main entrance, stone is used to clad a small volume next to a steel-framed canopy over the patio. The canopy shades not only the patio but also the large glass walls next to it. The primarily solid wrapper of corrugated metal gives way to a glazed expanse that is quite modern. Beyond, the open living/dining/kitchen area is visible. 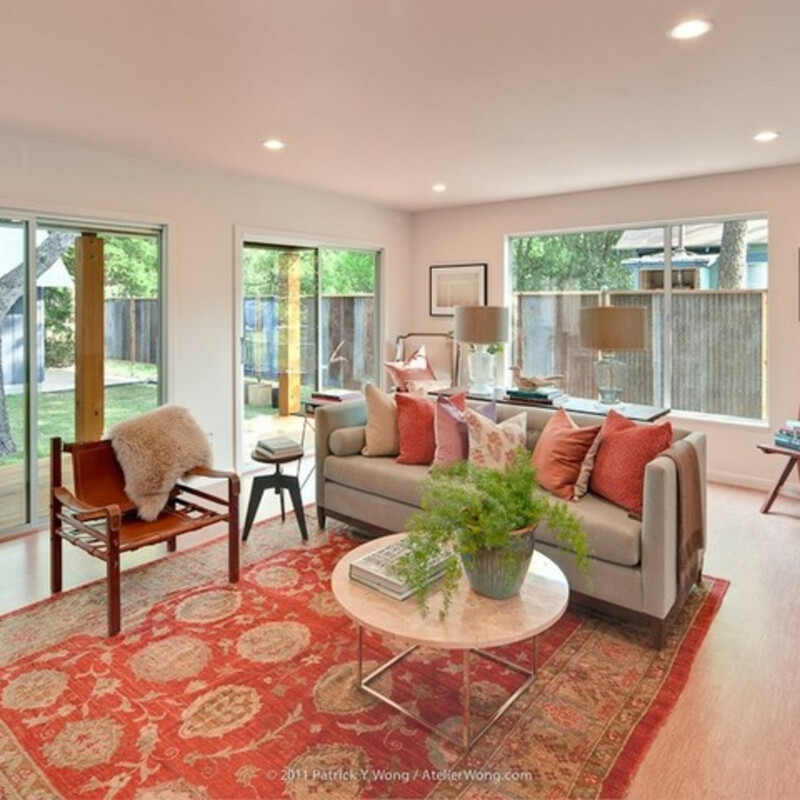 The interior is treated with a simple palette — wood floors, drywall walls, and ceilings — that fits with the open plan. A small detail that is worth noting is the base at the bottom of the wall. In many modern houses, this base is eliminated, necessitating a highly crafted joint that easily adds cost to a project. 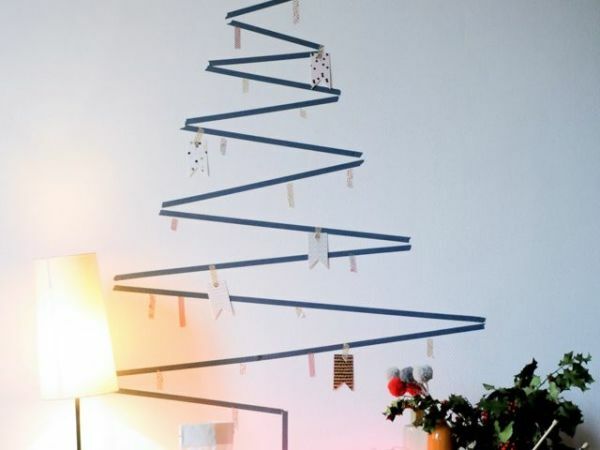 Painting the base to match the wall is an effective way of extending the simplicity of the space while saving money. 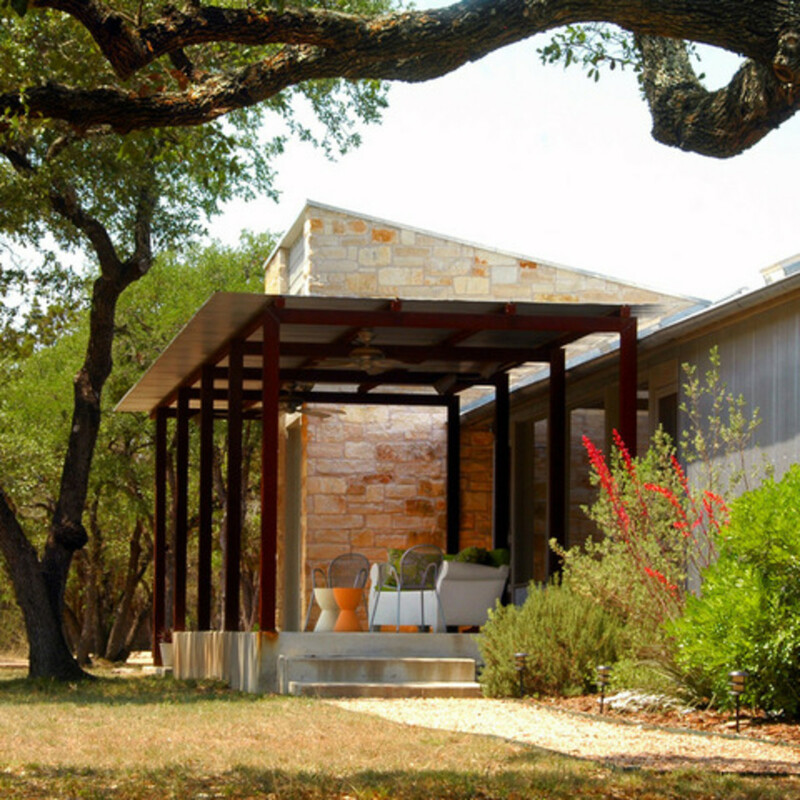 A low-maintenance landscape surrounds the house, lending it the understandable moniker, "Walkabout." 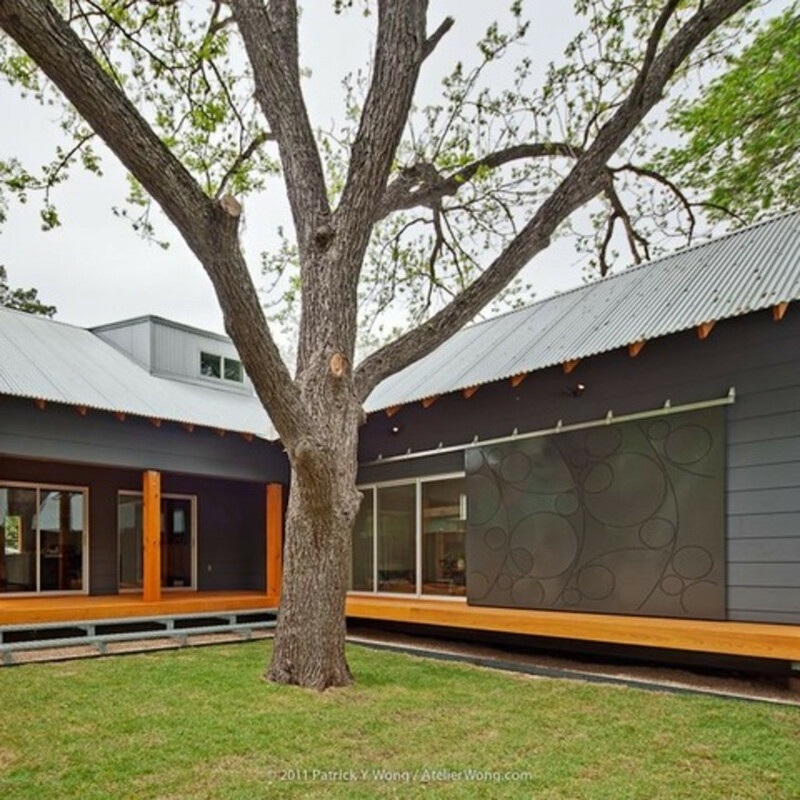 It looks like Texas is onto something in terms of low-cost modernism (with a clear vernacular twist). 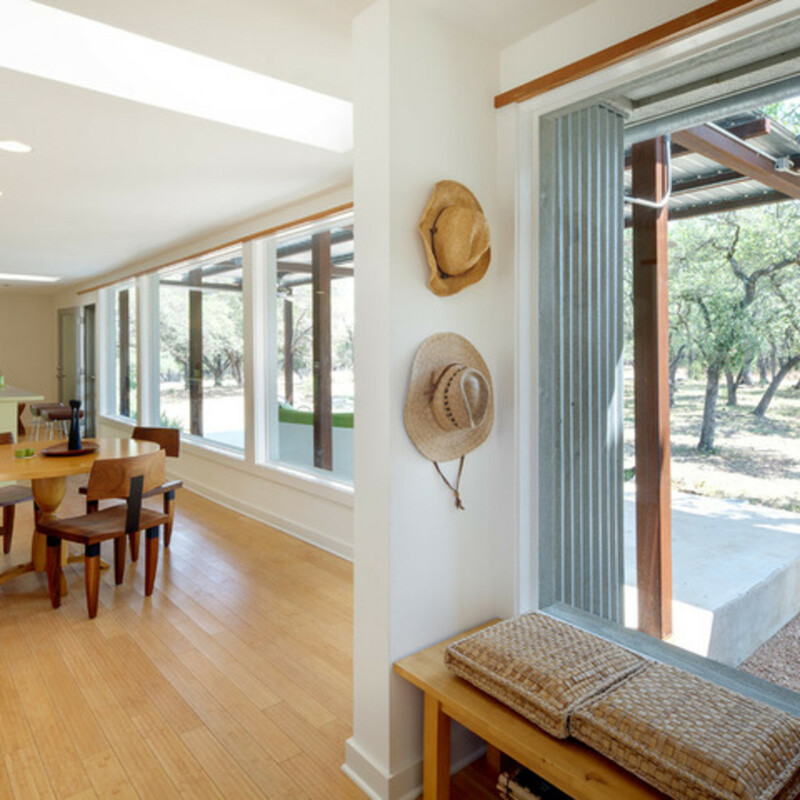 Designed by Stuart Sampley Architect, the Moontower Residence — named for the Austin landmark — is shaped by existing trees on the site; porches and glass walls take advantage of these natural features. 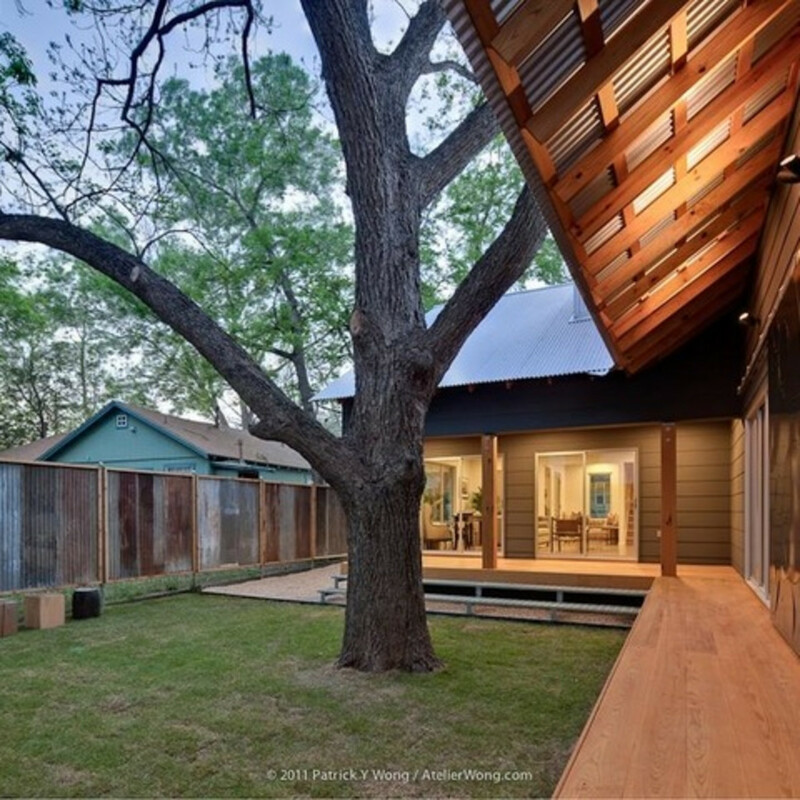 The exterior materials are corrugated Galvalume (roof), fiber-cement siding (walls), and locally harvested cypress (porches and soffits). Added to this minimal palette are some nice touches in metal: a sliding door by artist Susan Wallace, in particular, and steps made from grating. 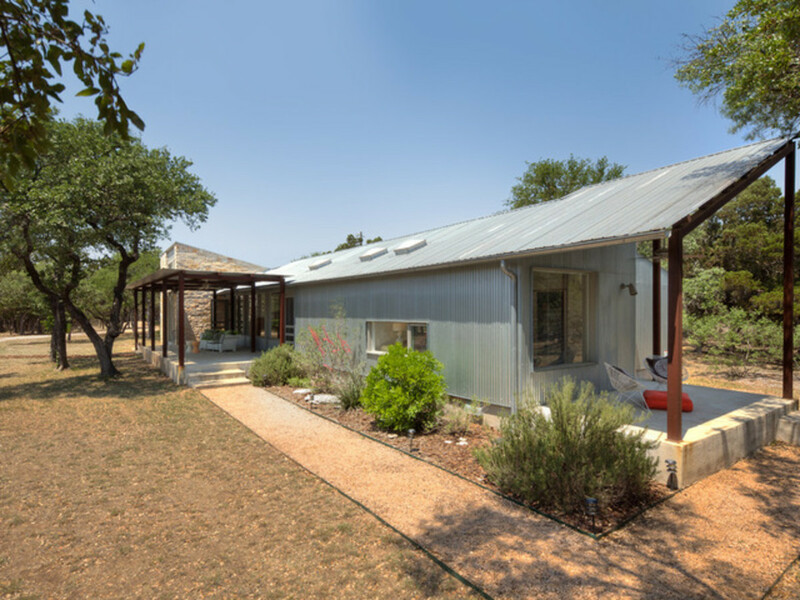 The fence of corrugated metal, an inexpensive construction, has a rustic appearance that melds with the house. 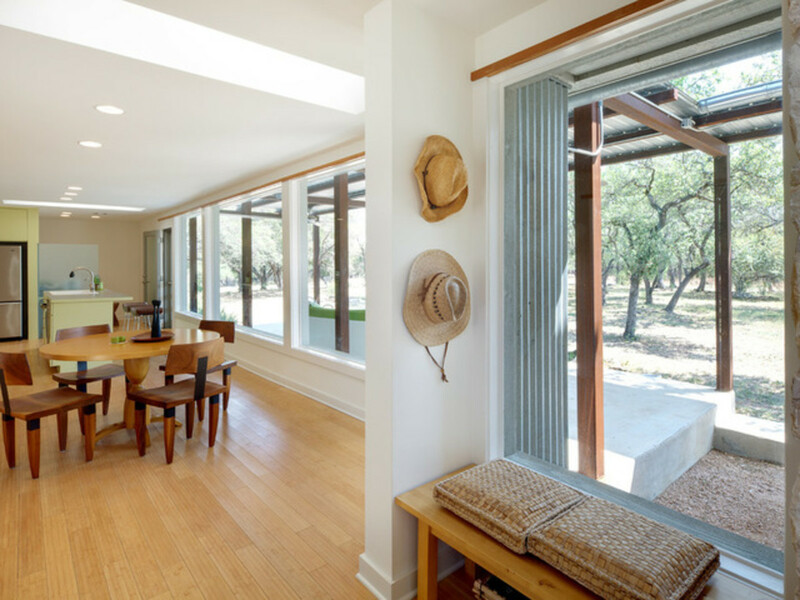 Like the first example, the interior is light and open, treated with wood and white drywall surfaces and fairly standard details (base, window frames, etc.). 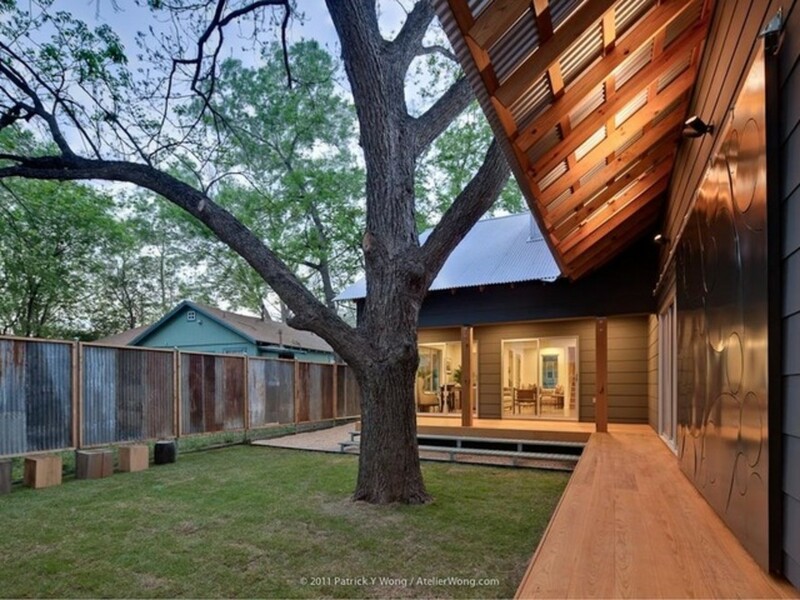 Sliding glass doors tie the interior to the exterior and place the focus on the large tree.